Monthly income seekers should close the position on KR as the stock has increased from the entry price of $24.12 to the closing price of $25.52. Investors will lock in a 2.1% return in 10 days for an annualized return of 76%. STRATEGY: Look at the May 2018 24 cash-secured put trade. For each 100 shares of KR stock you want to control, sell one May 2018 24 put option for a $0.70 debit per option or better. That’s potentially a 3.0% return on the cash-secured put trade. 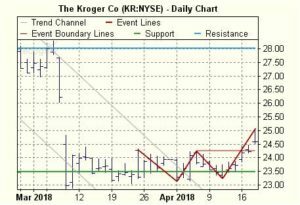 A “Double Bottom” chart pattern formed on The Kroger Co (KR on NYSE). This bullish signal indicates that the price may rise from the close of 24.58 to the range of 25.30 – 25.50. The pattern formed over 18 days which is roughly the period of time in which the target price range may be achieved. The Kroger Co has a current support price of 23.48 and a resistance level of 28.01. As income investors, we seek to create consistent monthly income by selling options to collect monthly premiums. This has been successful for our investors for years. Option selling offers another method to diversify investing strategies beyond traditional dividend investing. We have combined technical stock events with our strategy to identify high returns option selling opportunities. This income trade will generate a return of more than 160% annualized. Stock: Intellia Therapeutics (NTLA), a gene editing company, focuses on the development of therapeutics utilizing a biological tool known as the CRISPR/Cas9 system. The company develops in vivo programs focused on liver diseases, including transthyretin amyloidosis, alpha-1 antitrypsin deficiency, hepatitis B virus, and inborn errors of metabolism programs. 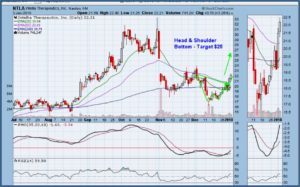 Chart: We have detected a “Head and Shoulders Bottom” chart pattern formed on Intellia Therapeutics Inc (NTLA on NASDAQ). This bullish signal indicates that the price may rise from the close of 21.51 to the range of 25.50 – 26.50. The pattern formed over 22 days which is roughly the period of time in which the target price range may be achieved. Intellia Therapeutics Inc has a current support price of 19.18 and a resistance level of 22.12. Strategy: We have an opportunity to sell options for income with NTLA as the stock should trade higher in the coming weeks. I recommend to place your trade and exit when you have locked in profits due to the stock price moving higher. Our goal here is to make income short term so we can exit and compound capital into another trade. For medium risk option trade, look to sell a January 2018 22.5 PUT for about $1.50. This creates a return of 7.1% to expiration in 16 days or greater than 162% annualized. For a conservative trade, you can setup a covered call trade. You can purchase 100 shares of NTLA and sell a January 22.5 CALL option for about $1.25 for an assigned return of 7.3% in 16 days for a 166% annualized return. As income investors, we seek to create consistent monthly income by selling options to collect monthly premiums. This has been successful for our investors for years. Option selling offers another method to diversify investing strategies beyond traditional dividend investing. We have combined technical stock events with our strategy to identify high returns option selling opportunities. This income trade will generate a return of more than 70% annualized. Stock: Teck Resources Ltd is engaged in the business of exploring for, acquiring, developing and producing natural resources. The Company’s activities are organized into business units that are focused on steelmaking coal, copper, zinc and energy. It operates in five segments: steelmaking coal, copper, zinc, energy and corporate. The corporate segment includes all of its activities in commodities other than copper, coal, zinc and energy. The RSI is above its neutrality area at 50. The MACD is negative and above its signal line. The MACD must break above its zero level to trigger further gains. Moreover, the stock is above its 20 and 50 day MA (respectively at 21.51 and 21.89). Chart: We have detected a “Double Bottom” chart pattern formed on Teck Resources Ltd (TECK). This bullish signal indicates that the price may rise from the close of 22.42 to the range of 23.90 – 24.30. The pattern formed over 18 days which is roughly the period of time in which the target price range may be achieved. 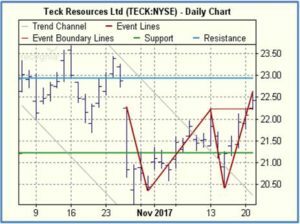 Teck Resources Ltd has a current support price of 21.22 and a resistance level of 22.93. Strategy: We have an opportunity to sell options for income with TECK as the stock should trade higher in the coming weeks. I recommend to place your trade and exit when you have locked in profits due to the stock price moving higher. Our goal here is to make income short term so we can exit and compound capital into another trade. We are selling PUTs to take advantage of the stock price move to the upside. 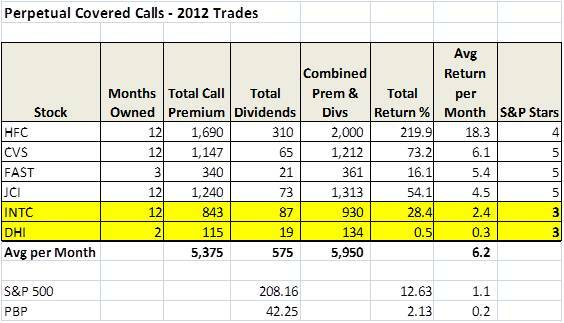 For conservative traders, you can create a covered call trade using the call for downside protection. Before you can become a millionaire, you have to start thinking like one. It isn’t just a pathway to wealth. It’s a way of life… a belief system… a mindset – and it will show you how to build a full, rewarding life. Join our Monthly Income Newsletter to get this trade and many other income trades. We have a new option trade for monthly income to share with subscribers. I have decided to take early profits on the CF trade as it moved above my $30 target price today for a great income in only 10 days. I will take early profits so I can continue to compound my capital be entering new trades. As income investors, we seek to create consistent monthly income by selling options to collect monthly premiums. This has been successful for our investors for years. Option selling offers another method to diversify investing strategies beyond traditional dividend investing. We have combined technical stock events with our strategy to identify high returns option selling opportunities. This income trade will generate a return of 5.8% using the forward month options. Stock: Nexstar Media Group, Inc. (NXST) operates as a television broadcasting and digital media company in the United States. It focuses on the acquisition, development, and operation of television stations and interactive community Websites in medium-sized markets. The company will report earnings on August 8. A “Symmetrical Continuation Triangle (Bullish)” chart pattern formed on Nexstar Media Group Inc (NXST). This bullish signal indicates that the price may rise from the close of 61.75 to the range of 73.00 – 76.00. The pattern formed over 55 days which is roughly the period of time in which the target price range may be achieved. A Symmetrical Continuation Triangle (Bullish) is considered a bullish signal, indicating that the current uptrend may continue. The formation occurs because prices are reaching both lower highs and higher lows. The technical event occurs when the price breaks out of the triangle formation to close above the upper (descending) trendline, thereby confirming the pattern. The RSI is above 50. The PMO is above its signal line and positive. The PMO is breaking above its zero level to indicate further upside. Moreover, the stock is above its 20 and 50 day MA (respectively at 60.04 and 59.91). Strategy: We want to sell a covered call on NXST using the August 2017 65 Call. For each 100 shares of NXST stock you buy, sell one August 65 covered call option for a $61.45 ($63.25 – $1.80) debit or better. That’s potentially a 5.8% assigned return with a 3.0% downside protection. If you want more downside protection, you can purchase an August 60 PUT for less than $0.25 per option. For PUT writers wanting to lower their cost of entering this position. You can sell a August 65 PUT option for $3.70. That’s a potential return of return of 6.0%. Investors should consider taking profits early as the stock price moves higher toward the $65 option strike price and exit if there is a pull back below support levels. You can use the PCD strategy if you want to use this stock for Monthly Income. This is a higher risk trade than we normally place in the Monthly Income Report. 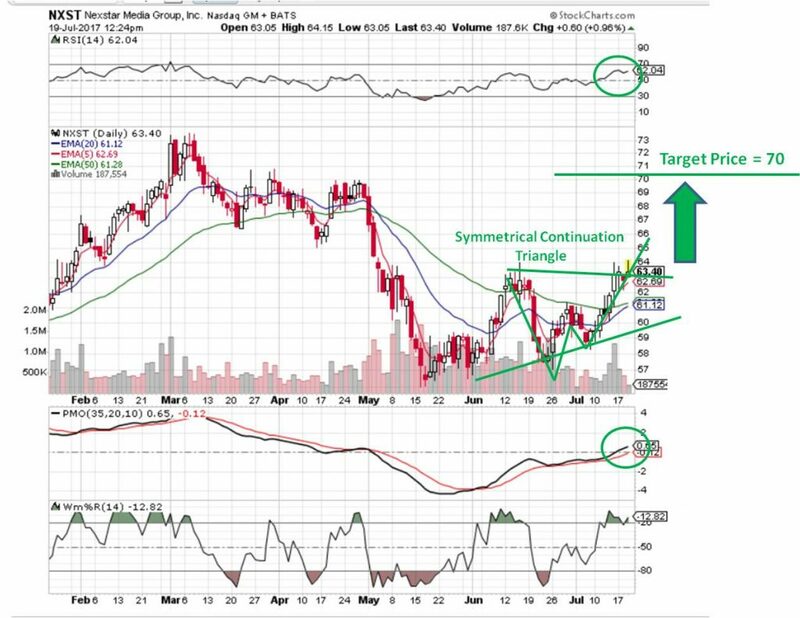 However, this is a nice setup with a positive merger announcement, positive technical confirmation and increased premium from selling options for income. Most experts in the stock market will generally say, “the writer of an options is foregoing any increase in stock price that exceed the strike price for the premium received when selling calls. The option writer continues to bear the risk of a sharp decline in the price of the stock. 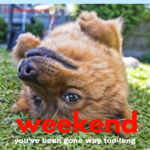 The cash premium will only offset this loss.” Do you buy into this way of thinking? This is not correct based on how I trade covered calls. With my method, you no longer care about the price of the stock that you purchased. 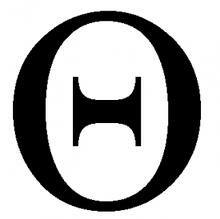 When the stock does go down, we would buy back the option at an inexpensive cost and immediately write a new option. For example, we received a premium of $3.00 and close it at $0.25 when the stock price drops. If the stock price went down $5.00, we would write a new call at at a $5 lower strike price. This may net an addition premium of $3.00 so when you add the premiums minus the buy back of the first option we have $5.75 while the stock only dropped $5.00. The second premium helped to offset the loss from the strike price. When the stock does not reach the strike price, let the option expire, keep the premium, and write a new cal at the same strike price. When the stock price goes above the call strike price, buy back the call option and write a new option at a higher strike price to reflect the gain in the stock. the second premium will help defray the cost of the buyback while you have a gain in the stock price. For the buyer, options are a wasting asset as time decay erodes value. The time value portion of a option is always zero at expiration. Selling the time value repeatedly on the same stock makes option income work for you. With my trading method, you will not be waiting on the stock price to go up to make money. You will make money on the wasting time value of options you have sold. this will change your investing philosophy about the stock market.